Life has been giving me lemons every morning for months. I get up and the first thing I have is twelve ounces of warm water with a half a lemon and one teaspoon of honey. [Cue my mom’s voice.] “It’s good for you”, followed with a litany of reasons why “THEY,” say I should drink it. I’m not going into that here because Google. But I do it. It’s like a penance for the delicious food, I eat the other 98% of the time. 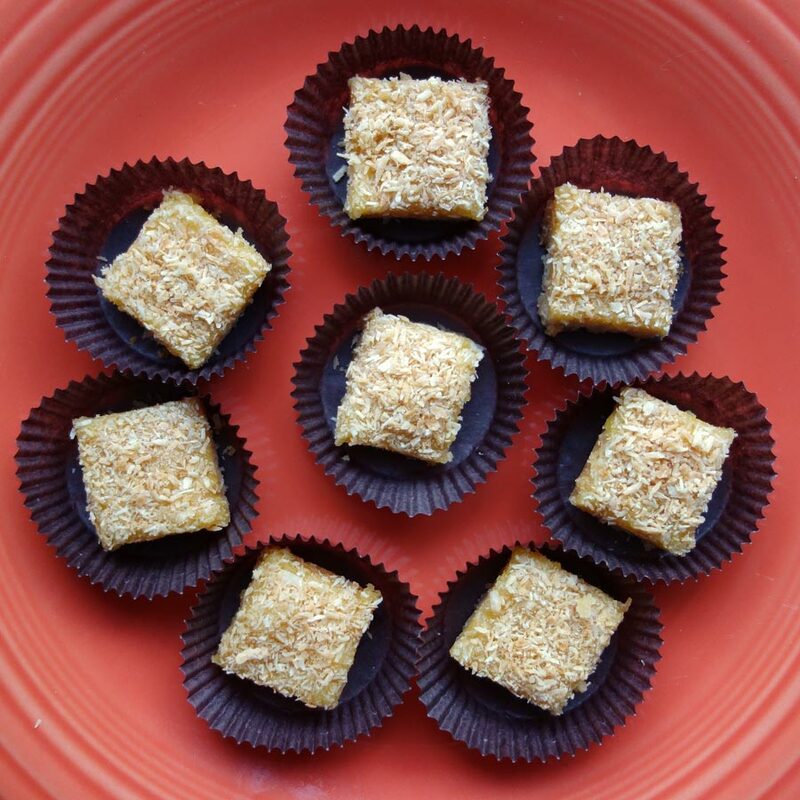 It’s during that span of time I make things like coconut shortbread topped with tangy lemon curd and toasted coconut. But the health plot thickened. As it happens my dry, winter feet looked like they were shedding coconut fragments. I know, GROSS!!! (Isn’t this a food blog?). When I asked on Facebook how to soothe and moisten them, many of my friends suggested I use coconut oil and one said to take it internally (RECIPE FOR DRY WINTER FEET below). Today, I mixed coconut oil in the lemon-honey-water and it made it taste a lot better. Hello?! YUM! The fat and sweetness of the coconut oil balanced the acidity of the lemon juice and honey was able to shine through. I actually enjoyed drinking it instead of having to make myself choke it down. All the things: the lemon, the honey, the coconut oil and the water are very good for your body—Google the health benefits of each, especially the coconut oil = SO GOOD FOR YOU and your pets. Leo, my cat, loves it too. Now that they taste good together, I’m pretty excited to face the day. Let’s get back to the Coconut Lemon Curd Shortbread Cookies. “THEY” have nothing to say about these. They are not healthy, but I say they are delicious. BTW: My feet have stopped shredding. They look and feel great. Soak your feet in Epsom salt, castor oil and warm water for one hour. Use 1 cup of Epsom and 1 tablespoon of castor oil in 2 quarts of water. Rub off your dry skin. You can use your fingernails, which was a little gross or a pumice stone or a pumice stone equivalent — I have those exfoliating gloves. Rinse and dry your feet with a towel. Slather your feet with coconut oil (the one I used had bits of coconut in it which provided more exfoliation). Cover “coconutty feet with plastic bags — I use the kind you get veggies in from the supermarket because Ziploc bags are too thick. Carefully pull socks over the plastic bags and go to sleep. In the morning, remove the socks and bags — I saved mine for another time since winter is just getting ugly. Wash your feet and feel the lovely. I adore the combination of coconut and lemon. I added coconut flour and substituted coconut oil for some of the butter for flavor. I added rice flour to give it the texture of a Scottish shortbread. Have ready a 9” x 13” x 1” sheet pan. In a medium bowl, cream together the coconut oil, butter, sugar and vanilla until light and fluffy. In another bowl mix together the flours and salt. Mix the flour mixture throroughly into the butter mixture. Press the dough evenly into the sheet pan and chill in the refrigerator for 30 minutes. Remove from the refrigerator and pierce the dough all over with a fork. Bake for 30-40 minutes until golden. Check the pastry at about 20 minutes to make sure the dough has not puffed up. If it does, poke it again with a fork and gently press it down with a clean dish cloth or a pot holder. Cool. While the shortbread base is cooking, prepare the lemon curd by combining the lemon juice, lemon zest, eggs, sugar and salt in a double boiler on medium heat. Whisk until the ingredients thicken well, about 10 minutes, stirring constantly. Keep warm by covering the top of the curd with plastic wrap so it doesn’t skin. Cover shortbread base with lemon curd and top with toasted coconut. Trim edges and eat them. Cut into 1.5” squares. I thought about doubling the recipe for the lemon curd for this recipe. If you’re a lemon freak, do it. My recipe tasters said there was enough lemon curd, but I have to wonder, if there’s ever enough?